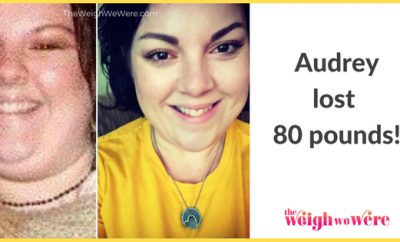 How I Gained It: I have struggled my whole life with my weight. I was always the biggest girl in school. I never played sports because I was too scared I couldn’t keep up. I was teased on a regular basis (even by family members) from the age of 4. I met my now-husband in 2004. He had also struggled with his weight. Food became our entertainment; we would eat at Taco Bell at 2 a.m. just for something to do. By our first wedding anniversary in 2008, I had ballooned to my heaviest weight at 311 pounds. I tried many diets, but nothing stuck. I would lose 25 pounds and gain 30 back; I figured I would be heavy for the rest of my life. But my health was starting to suffer. I was pre-diabetic, my cholesterol was borderline-high, and I was taking five pills a day for my blood pressure. I was also suffering from severe anxiety and unexplained infertility, which my doctors believed was due to my weight. 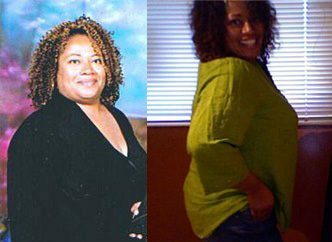 Breaking Point: I went as far as to schedule gastric bypass surgery in August 2010, just so I could do something lasting about my weight. I was sick of not being able to buy clothes off the rack. I was sick of feeling sick all the time. I was sick of looking at myself and not liking what I saw. I was sick of not feeling attractive to my husband. I felt hopeless; when you weigh that much, you feel like there is no alternative. 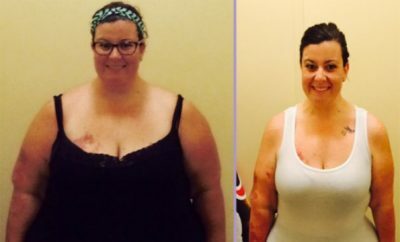 But after seeing people who had the surgery who later gained back all the weight, I knew even gastric bypass wouldn’t solve the problem. I was too young and too healthy to lose weight like that; I had to be able to prove to myself I could do it on my own. Plus, I really could never accept the fact that my stomach and body would never be the same after surgery. Why put my body through something that can be avoidable? How I Lost It: After my husband lost his job near the end of 2010, we decided to leave our home in upstateNew York and move across the country toPhoenix,Arizona for a sort of “new beginning.” We decided since we were starting fresh in a new place, we could take control of our health too. I stopped eating processed foods, limited my carb and fat intake, and cut my total calorie consumption to just 1,300 a day. I go to the gym every day (sometimes even twice a day on weekends) and discovered I love exercising! I allow myself a “cheat” day now and then, but I have found I don’t need to splurge as often because I really love how I feel when I eat healthier. 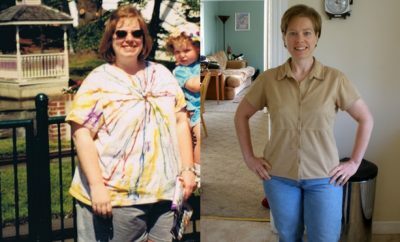 Along the way my husband also lost a lot of weight: When we started, he weighed 377 pounds. Today, he weighs 269 pounds! One of my favorite things to do now is run. A few months into my lifestyle change, I decided I wanted to be able to run a 5K race by my 30th birthday. I trained and focused on my goal, and when I crossed that finish line on November 19, I burst into tears. It was something I never thought I’d be able to do. Our journey is far from over, but I’m no longer on medication and I have never felt so good in my entire life. What an accomplishment!! Takes determination and love of yourself and your family. Don’t short change your family by shortening your life with poor health if you can help it!! I was wondering where these posts were. Missed them. This lady looks amazing. 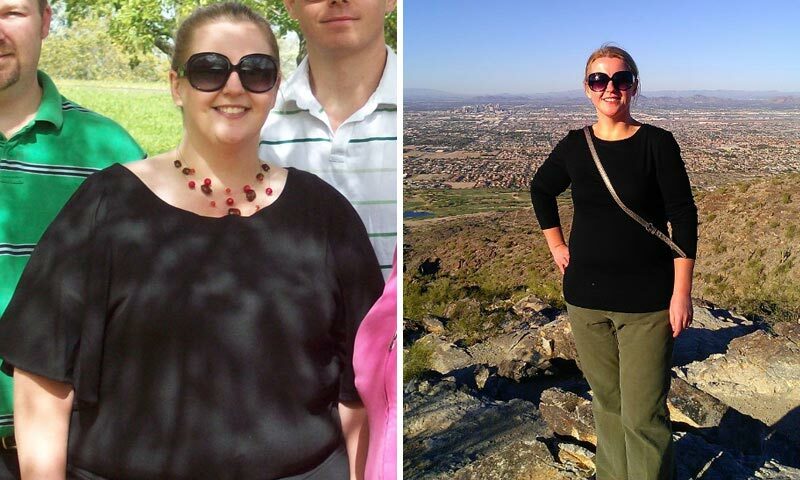 Congratulations on your accomplishment….you look fantastic!!! I LOVE these before & after stories! Sticking to it, will do it! Good for her! Ann you are such an inspiration! Congrats to Ann! Being taken off all meds is the BEST, isn’t it? Just earlier this month my doctor took me off all of mine. What a great feeling. Oh, and your body will heal more quickly if you injure yourself. Bruises don’t last as long, cuts heal faster, aches and pains don’t last, cold and flu are less frequent and a whole lot less miserable. Congrats to your husband, too! Trying that now… Very hard to do. Hope I have those kind of results. Definitely have to cut that crap out. Good job.